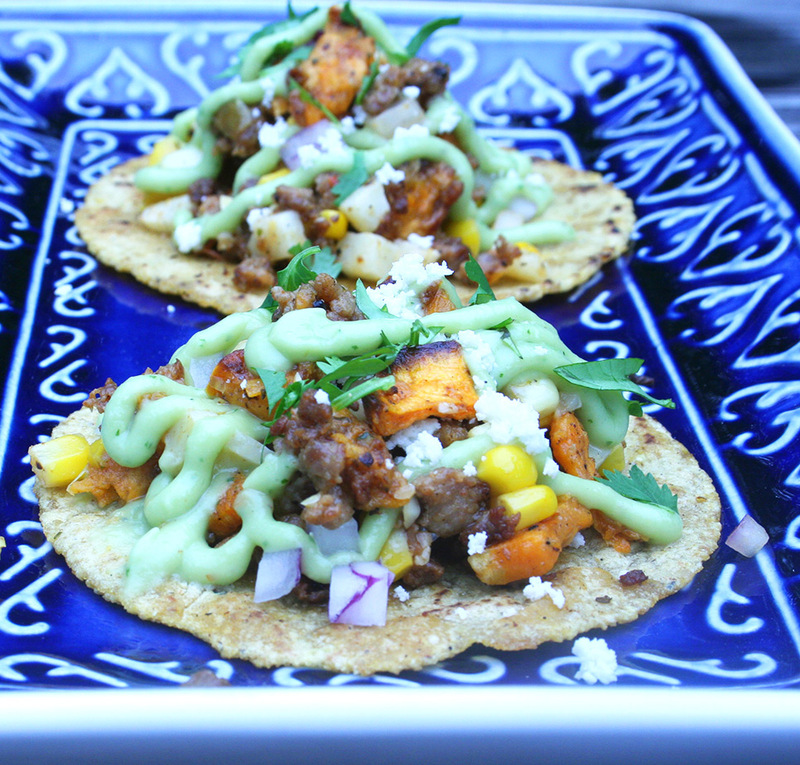 Spicy Mexican Chorizo with Roasted Sweet Potatoes and Corn. So we’ve been making a lot of burritos and tacos with french fries in them. Our versions of the California burrito. They’re awesome. Got me to thinking that potatoes go really well in burritos and tacos. 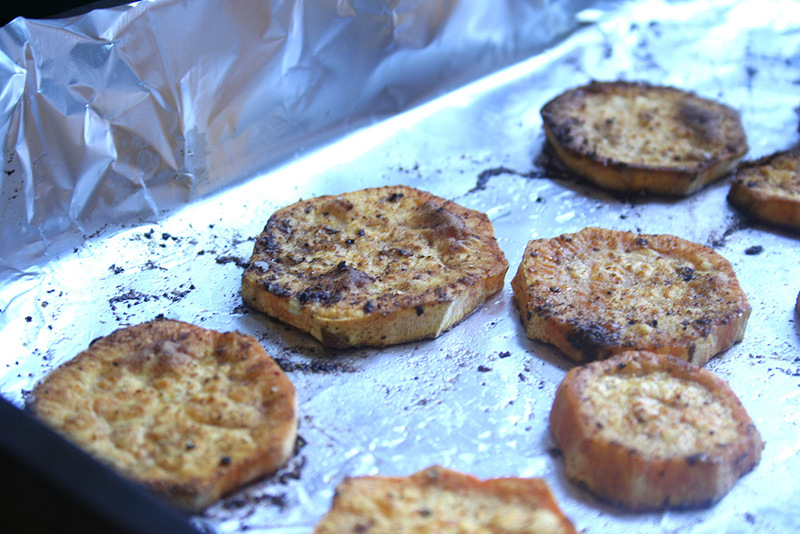 And, the sweet potato is a healthy alternative to french fries. It also tastes great and has such great color when it’s roasted. Potatoes and chorizo are an awesome combination. 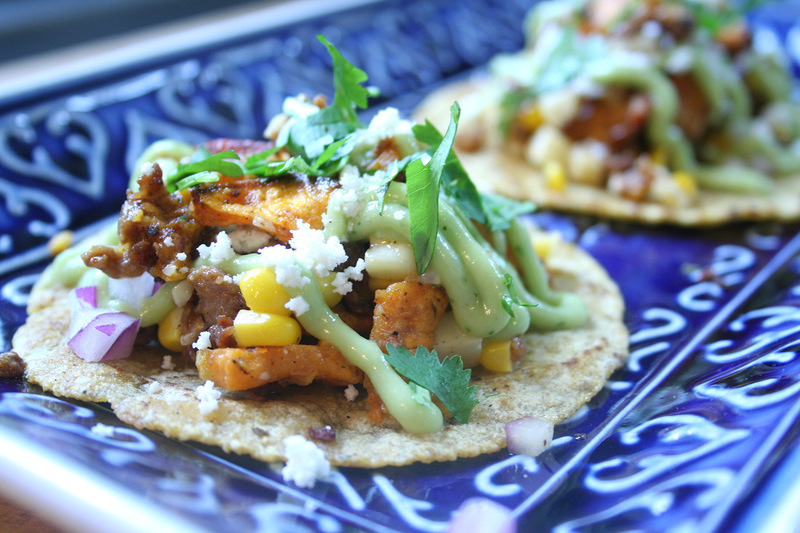 Ok, so chorizo isn’t the healthiest of taco ingredients, but you know. These are a little healthy I guess. Either way, these are really tasty. 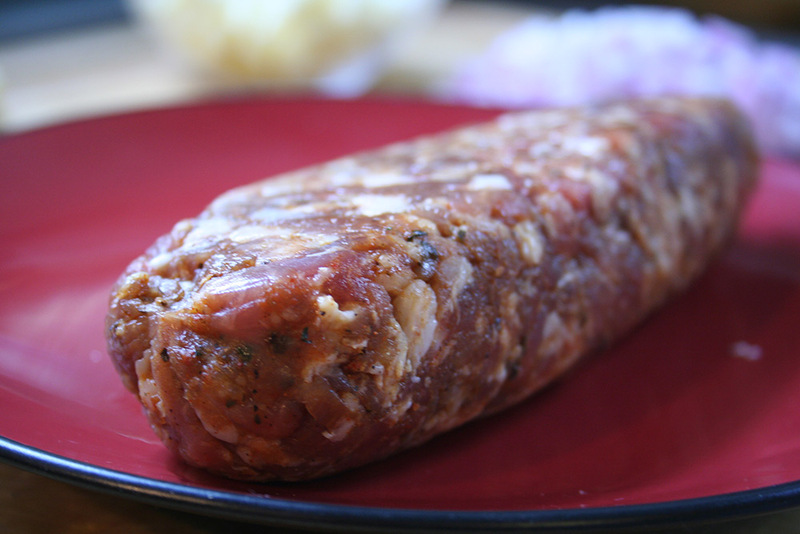 I like to cook the chorizo down until it’s a bit crunchy and the fat has rendered out a bit. Then I heat the tortilla in the rendered fat. 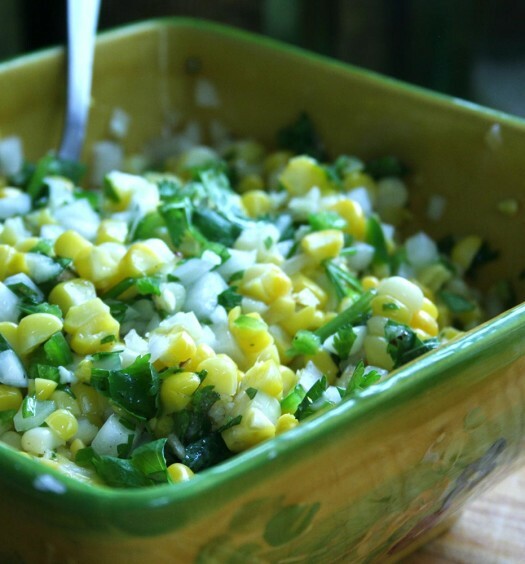 Adds a wonderful flavor to the corn tortillas. Awesome. Preheat oven to 450º. Peel the sweet potato and cut into 1/4 inch slices. In a bowl, combine cumin, a few pinches of salt and pepper, and vegetable oil. 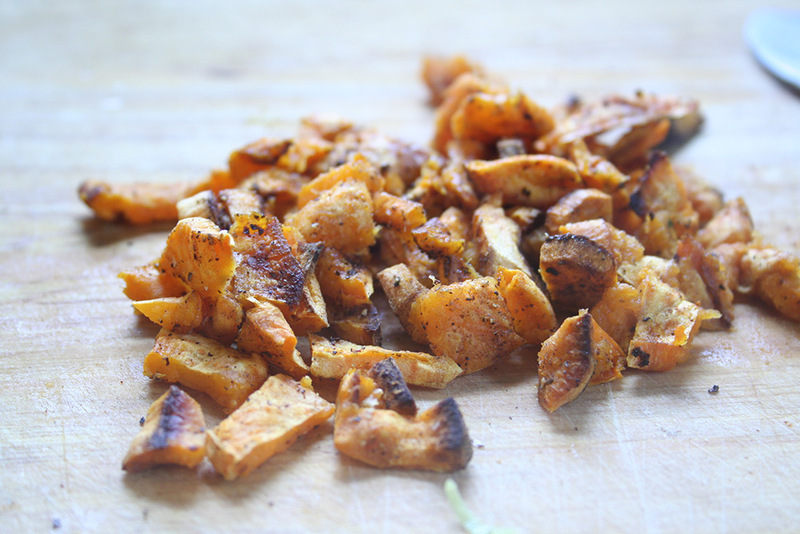 Add the slices of sweet potato and stir to coat potatoes. Place on a foil lined baking sheet. Place in the preheated oven. Cook for 10 minutes. Flip, and cook another 10 minutes. Remove from oven. Cook the corn. I use an easy technique using the microwave. 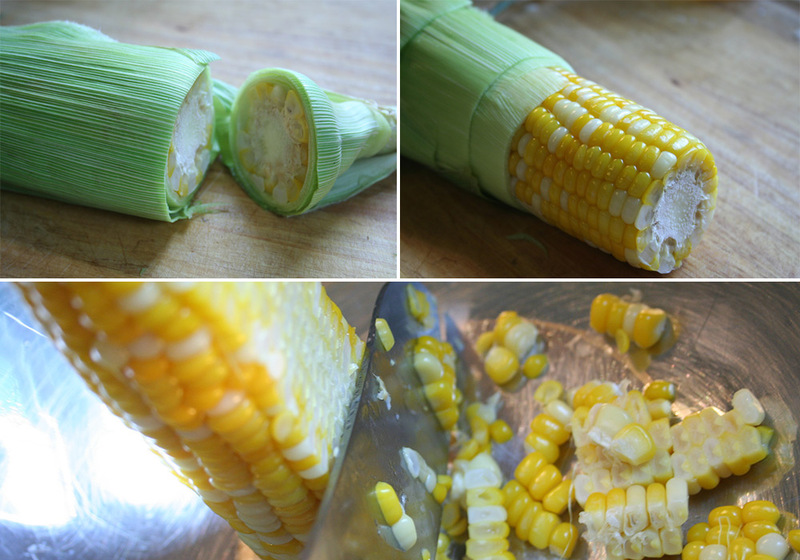 Place the whole ear of corn (un-husked) in your microwave and cook for 4 minutes. Remove from the microwave and let sit for a minute or two. Cut through about 1 inch up the stalk end of the corn. Grab the top of the corn and push the corn out of the husk. It will come out easy and clean of any threads. Place the cut end down in a large bowl and cut the kernels off. A large bowl is key to catch the falling kernels. Otherwise the kernels end up everywhere. 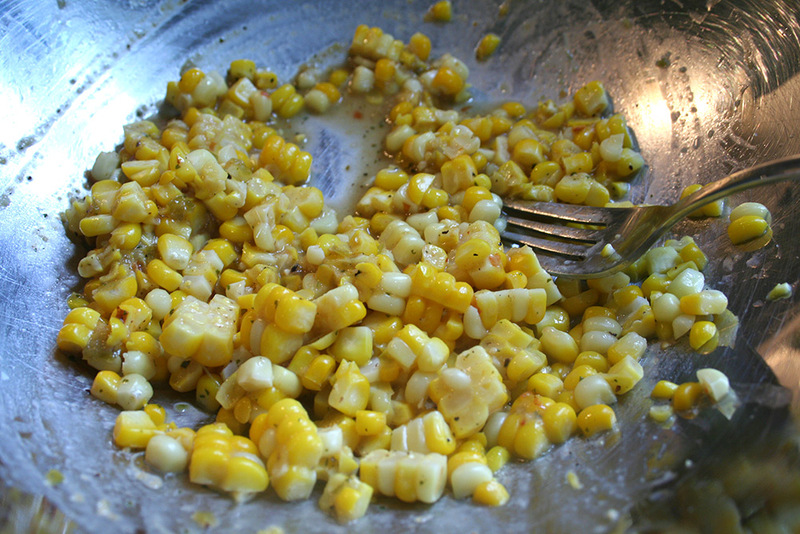 Add the butter, lime juice, and a few pinches of salt and pepper to the corn. Heat a cast iron or heavy bottom pan over medium-high heat. Add a tspn or so of vegetable oil. 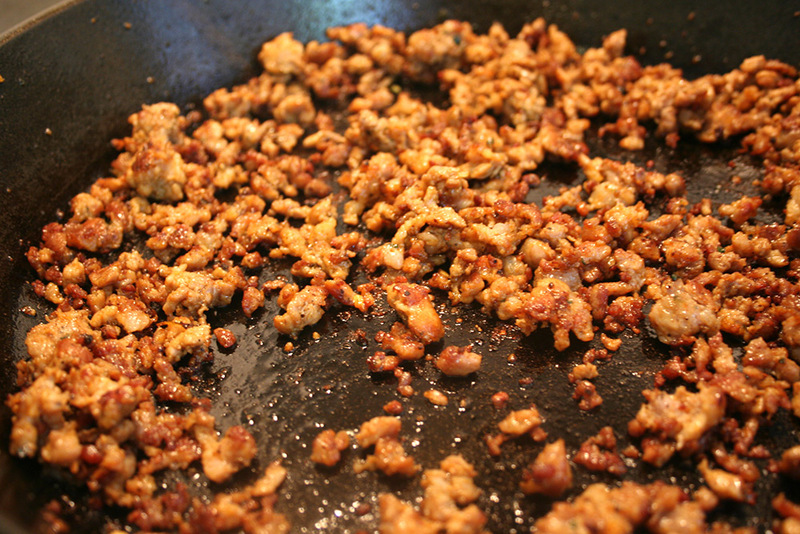 Add the chorizo and break up a bit with a spoon. Cook for 2-3 minutes while occasionally breaking apart more with your spoon. Lower the heat to medium, and cook for another 4-5 minutes until the chorizo is nice and crispy and the fat has been rendered from the chorizo. Dice the sweet potatoes into small pieces and add to the corn along with the chorizo, about 2 Tbsp of the diced red onions, cheese, and about 2 Tbsp of the salsa. Stir. 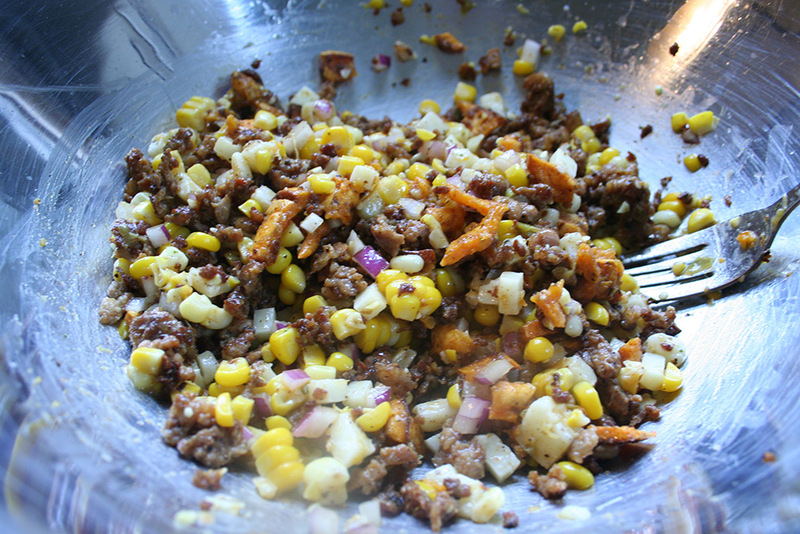 This is the taco filling. 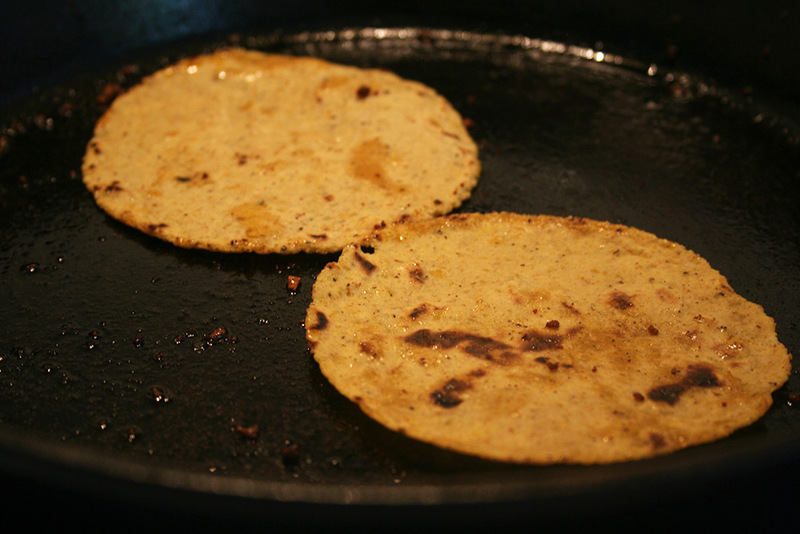 Reheat the tortillas over medium heat in the rendered chorizo fat. Cook for a minute or two until nice and soft. Flip a few times while your cooking. Place a few spoonfuls of the filling on each tortilla. 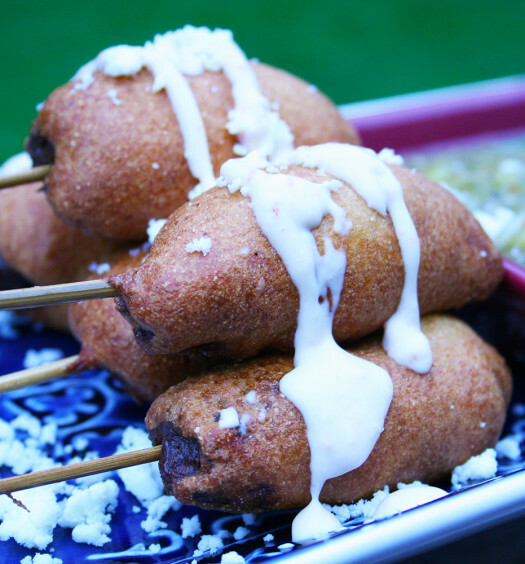 Garnish with a drizzle of avocado sauce or diced avocado. 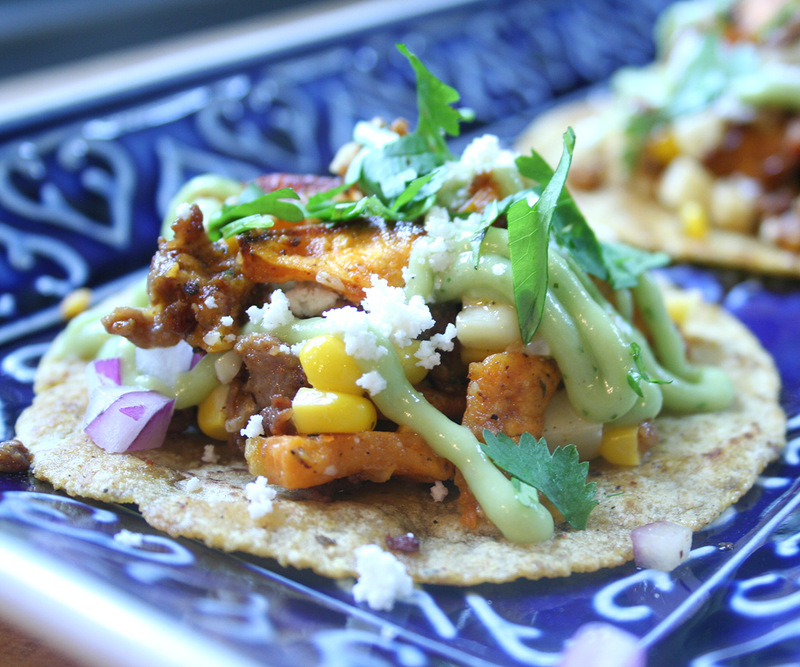 Sprinkle with a bit of queso fresco and a bit of chopped cilantro. Awesome.